EDUCATION: High School Graduate. Several college credits, no current degree. OCCUPATION: Full-time Criminal Law Student / Part-time on-call F.B.I. Field Agent for S.P.E.E.D. task force: STEEL RAIN (classified). KNOWN RELATIVES: James Watterson Smithers (father); Lillian Smithers (mother: deceased); Susan Marjorie Smithers (sister: deceased). ORIGIN OF ABILITIES: Janie's power was probably with her from birth, for it is very early in life that her medical record shows the "headaches" she complained of for years. In fact, Janie's power was acting on its subconscious level, collecting and carrying trace amounts of molecular metal. It wasn't until she fell during a rock-climbing expedition that her potential was thrust into play. As she plummeted from a 150 foot cliff, the reflex of survival caused her power to form a thin net of ferrous metals around her body. 7 feet from crashing to the cliff's base, Janie curved off into sudden, erratic flight. This ended abruptly due to her own shock, causing her to break her arm and 2 ribs, but the evidence of her hidden mutant ability was now blatant. After recovery, Janie turned to S.P.E.E.D. for testing, registry and discovery. Janie has since learned not only how to use her strange abilities, but also how to block out the automatic scanning for ferrous elements her brain would perform, ceasing her lifelong struggle with headaches. ABNORMAL BIOLOGY/ABILITIES: Silverstorm is a psychic with a singular ability, which current psychokinetic researchers refer to as: specified telekinesis. This is defined as a telekinetic power which is limited (perhaps subconsciously) to a single or small group of elements, actions or affects. In this case, Silverstorm is able to affect only ferrous metals on a molecular level. Whereas she is limited to this small range of elements, she is unlimited in the application of this power. Silverstorm uses this telekinesis to loosen the molecular bonds of any metal structures and trace amounts of molecular metal in her surroundings (an approximate 20'-50' radius). Although she "collects" trace amounts subconsciously at all times, Silverstorm can, at will, target visible metal objects and begin to disassemble them. The only types of ferrous metal she has any difficulty in disassembling are those that have had certain types of radioactive bombardment. This appears to the onlooker as if the objects simply disintegrate into thin air. At this point, Silverstorm controls countless trillions of molecules, which she can then reassemble into any shape she can visualize. Once reformed, these objects are still under her complete telekinetic control. Although it would seem that Silverstorm could simply levitate or telekinetically hurl any metal object, she appears to only have this type of control after having "processed" metals by reassembly. Unprocessed, Silverstorm is only able to levitate collections of molecules up to the weight of a ball-point pen. Silverstorm is able to create a myriad of metal shapes, including stakes, spikes, cables, bars, blades, shields, walls, clubs, and so on. Silverstorm has incorporated a wide range of effects with this arsenal, from a barrage of daggers or clubs (varying from incapacitating to lethal) to floating shields (varying in size to match the situation, usually bulletproof), winding cables, and more. Silverstorm is not capable of forming complex machinery such as locks or engines without literally memorizing every part of the structure or working from a diagram. Silverstorm is also not able to form firearms or explosives as these are primarily functional due to their chemical components, which she has no control over. Silverstorm can create weapons for her teammates to use in the realm of swords, staffs, blowguns, shields and other hand weapons. 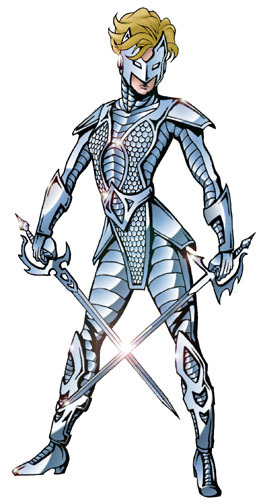 Silverstorm's power level is, of course, directly connected to her surroundings, though her upper level limits do appear to stop around 50 tons of material that she can control at any given time. For example, in a mall parking lot, Silverstorm could maintain a heavy barrage of metal projectiles almost indefinitely, constantly reusing the resources at hand, however, in a remote region such as a desert, Silverstorm would be practically powerless. Silverstorm is able to carry an undetectable "cloud" of loosened molecular metal for as long as she concentrates somewhat upon it (this usually disperses after 30 minutes or so). Silverstorm has memorized one particular pattern, that of her costume. Despite the ease of dressing by using her power, and providing a minimum of physical protection, Silverstorm is able to fly by telekinetically manipulating the costume that encases her. Controlling her costume as well as any construct she reforms, she is able to fly at any height or speed that enables her to breathe (she has been clocked at over 100 M.P.H.). Silverstorm is also quite adept at maneuvering in flight after some time in practice at S.P.E.E.D. labs. Silverstorm cannot carry more than her physical strength will allow unless encasing persons or objects within reformed constructs. Her costume, although memorized, often variates per the situation, enabling her to minimize it in high temperatures or reinforce it for heavy combat situations or cold climates. As a final note, Silverstorm has trained herself in several forms of hand-weapon combat styles, concentrating especially on sword-fighting (having already acquired an interest in fencing in high school). Silverstorm is now considered one of the foremost athletes in several sword-fighting techniques, including fencing, broadsword reenactment (through the S.C.A.) and Japanese Kendo.